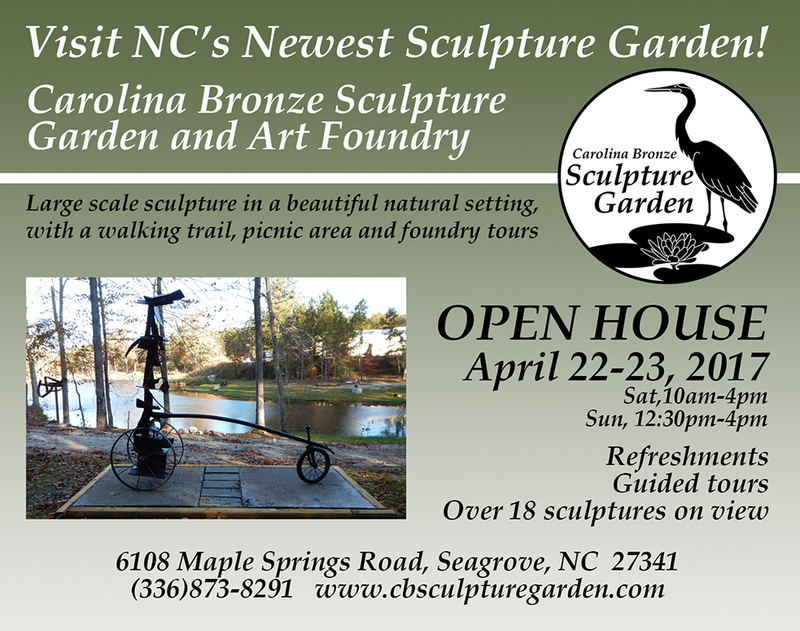 Carolina Bronze Sculpture Garden is hosting an Open House on April 22, 10 am-4pm and April 23, 12:30- 4pm. The Sculpture Garden will be open for walking tours. The Carolina Bronze Foundry will be open for guided tours. The Carolina Bronze Sculpture Garden is a natural and landscaped area overlooking a beautiful pond. A walking trail loops around the pond with over 19 sculptures on view. The landscaped and natural areas have a focus on NC native plants and trees. As an extension of this park, a sculpture is installed in the downtown area of Seagrove. The Open House will be in conjunction with the 9th Annual Seagrove Celebration of Spring Kiln Openings and Studio Tours. Carolina Bronze Sculpture has been known for over 25 years as the East Coast's finest bronze casting foundry providing the highest quality sculptures for artists all over the country. We are at the forefront of the digital technology overtaking the casting industry and are a full service foundry. We have opened the Sculpture Garden to help promote the arts in our community. ← Four New Sculptures Installed!